For American lawyers, the answer is simple: “The English had used their own Declaration of Rights to depose James II and these acts were deemed completely lawful and justified,” they say in their summary. To the British, however, secession isnt the legal or proper tool by which to settle internal disputes. “What if Texas decided today it wanted to secede from the Union? Lincoln made the case against secession and he was right,” they argue in their brief. 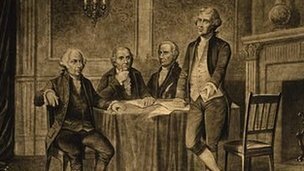 via BBC News – Is the US Declaration of Independence illegal?.